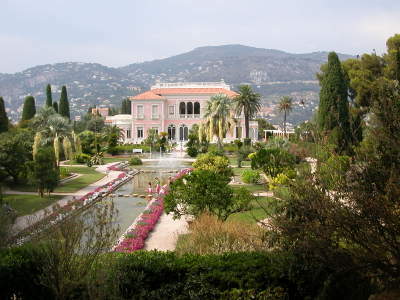 After lunch today in the colorful seaside village of Villefranche-sur-Mer, La Petite Maman and I visited the nearby rose-colored Villa of the Baroness Béatrice Ephrussi de Rothschild, with it’s impressive collection of antique furniture, rare porcelain, and Beauvais tapestries. After a self-directed tour of the interior of the estate, we wandered around the fragrant gardens with its temples, sculptures, roses, exotic plants, fountains, and beautiful views all around, including the beautiful view of the Rade de Villefranche, the protected bay of Villefranche-sur-Mer. We stopped into the restaurant in the villa for a citron-pressé to cool off before the drive back to Antibes. I think LPM (La Petite Maman) was surprised when she was served a tall glass with about 5 centimeters of freshly-squeezed lemon juice, a pitcher of water, and a basket full of sugar cubes. It took a lot of sugar and water and ice cubes, and did I mention, a LOT of sugar, but the cold summer drinks hit the spot on this hot and sunny afternoon.